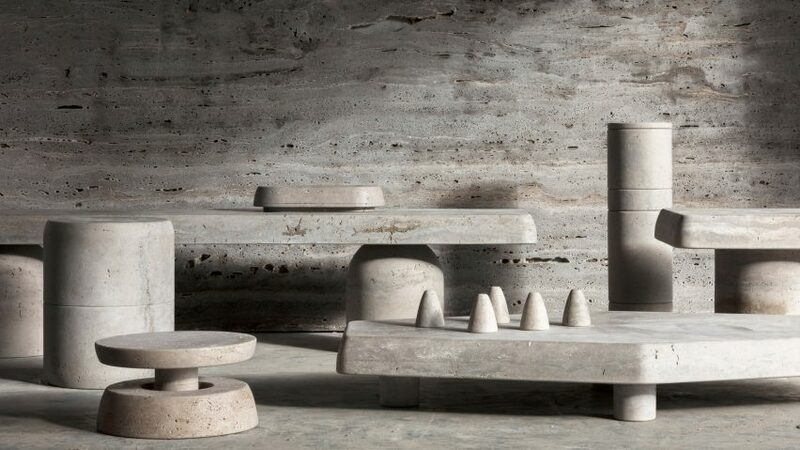 A series of matching stoneware designs by French designers Francesco Balzano and Valeriane Lazard is on display at Studio Twenty Seven gallery in Miami. The limited-edition Primitif collection is the result of a collaboration between the designers, and includes eight pieces all made of the same material. 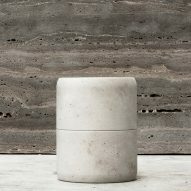 Included in the set are a stool, table, bench, side table, coffee table, jars, wall light and paperweight. Each is carved from beige-coloured Pietra di Medici limestone quarried in Italy, so they all have similar textures and tone. 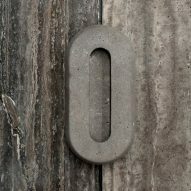 Simple monolithic shapes were also used across the different-sized pieces. "The design is a tribute to fabulous UK architectural site of Stonehenge," said the designers. 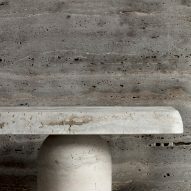 A long pale stone bench is made from two arched bases that support a flat slab of limestone. Adding cohesiveness to the collection, a bedside table titled Gueridon has a similarly thick top and is the same height as the bench. 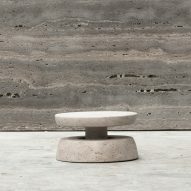 The Totem series of five stone jars perfectly stack atop each other to form a rounded stone pillar. A cover seals off the design, and can fit on each of the vessels – all of which are different heights. "The result of this work is the expression of a minimal discussion drawn by two French designers inspired by timeless lines and functions," said a statement from Studio Twenty Seven. A coffee table is constructed from four legs with a six-cornered top. The opposite sides are parallel to each other, forming a stretched hexagon shape. Two circular designs stacked on top of each other with a pillar between form a side table. A light source sits inside to transform the table into a lamp. The collection also includes a wall lamp in the shape of an elongated oval. A hollowed section in its centre fills with light and disperses the rays when switched on. Four cone-shaped designs act as paperweights. 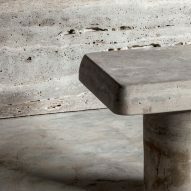 These smaller designs and all the furniture pieces are produced together in Belgium by stone company Van den Weghe. Based in Miami, Studio Twenty Seven sells a variety of designs and fixtures. It is the only gallery that represents Francesco Balzano's work in the US. 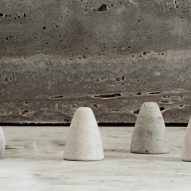 Despite its weight, stone is a popular material for homeware. 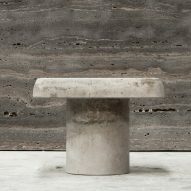 Other designers that have exploited its heavy, textural properties include New York designers Chen Chen and Kai Williams for a series of stackable white planters, British designer Max Lamb for a set of black basalt tableware with rough edges, and Mexico's EWE Studio for a collection of greyscale stools and vases. Photography is by Annick Vernimmen.